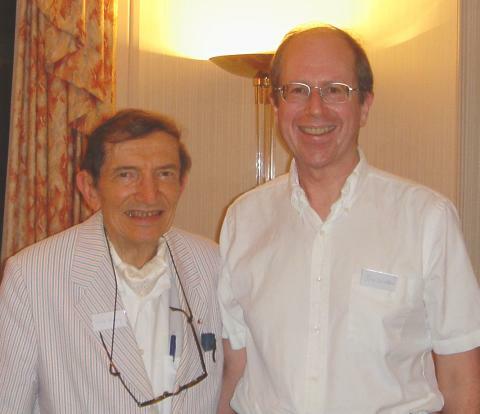 Legendary market and geopolitical analyst Harry D. Schultz and John Walker take a break for a photo op at around 02:00 local time while following the U.S. election returns on 2004-11-03 in Montreux, Switzerland. As Yogi Berra said, "It's hard to make predictions, especially about the future. ", but the predictions of the attendees at this soirée, declared before the polls closed in the U.S., were accurate to a degree unmatched by any of the polling services or news media. By 02:30, the outcome (based on Bush running ahead of his 2000 figures) was sufficiently obvious we decided to call it a night.